The 2009-W $10 Anna Harrison First Spouse Gold Proof Coin is the ninth in a series created by the US Mint to honor the spouses of the former Presidents of the United States. While the coin is the ninth for the program as a whole, it marked the first one to be released in 2009. 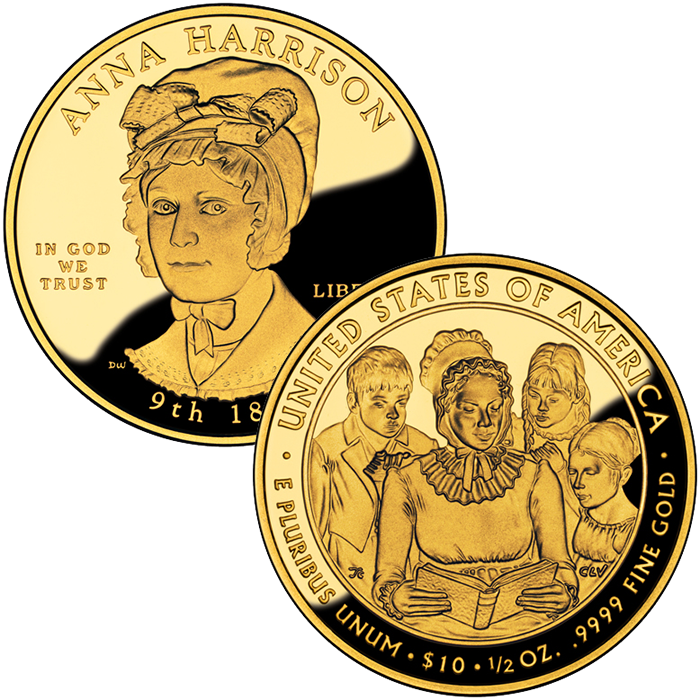 As with all First Spouse Coins, the Anna Harrison strike is created from 1/2 ounce of .9999 fine 24-karat gold. Anna was married to the ninth President of the United States, William Henry Harrison. Typically, only four First Spouse Coins are released per year as they are issued to correspond with the circulating Presidential $1 Coins. However, the authorizing legislation makes provisions for Presidents who served with more than one spouse like the above Letitia Tyler and Julia Tyler coins. In an instance like this, both are honored with separate coins. If a President was not married during his tenure, an image of the mythical figure Liberty will be used in place of a spouse. Each coin is struck from 1/2 ounce of .9999 fine gold making its intrinsic value much higher than the face value of $10. 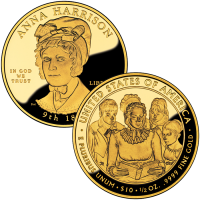 When first released, the US Mint charged $629 for the Anna Harrison First Spouse Gold Proof Coin. However, the price fluctuated after that according to the Mint’s precious metal pricing matrix.